For most people, the 14th of February consists of: overpriced, overcrowded restaurants filled to the brim with couples who aren’t talking to each other; tasteless heart-themed cards; tired, formulaic romcoms and lots of people trying to sell you stuff. The idea that this is a day to celebrate love seems to have got lost somewhere. Rather than going out, why don’t you stay in and cook together? Plan a special day with your loved one where you go to the market, get some beautiful flowers for your home, a great bottle of champagne/sparkling wine and fresh food that you are going to prepare together. Luckily, Valentine’s Day is on a Saturday this year. Instead of that crowded restaurant, enjoy your home cooked dinner by candlelight, without the miserable-looking couple on the next table trying to listen in on your conversation, because they ran out of things to say year’s ago. Couples who cook together are happier! What the whole Valentine’s industry seems to have missed is that the essence of romance is being both unique and spontaneous. 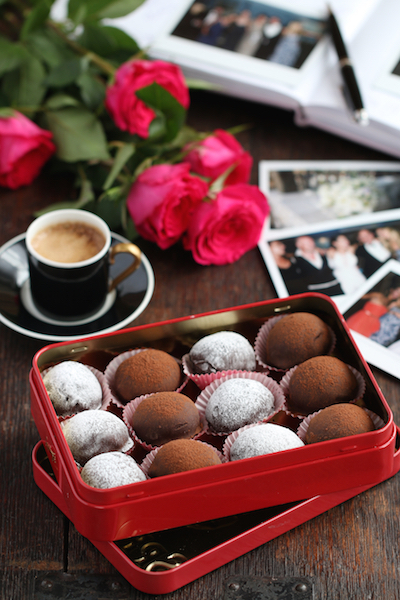 It is with this in mind that I suggest a perfect end to your special evening: my ‘Champagne Truffles’, which, like all the best things in life, take time to prepare, but the smile that you see on your partner’s face when they bite into the first one will be worth every moment! Start the day before. Pour the champagne in a saucepan and reduce by half (〜5-10min). Put on the side. Halve the vanilla pod, scrape the seeds into another saucepan along with the double cream and the butter – bring to a boil. Put the white chocolate into a bowl and pour the cream over it as well as the reduced champagne. Mix with a spatula until everything is melted (it is crucial that the chocolate is finely chopped otherwise it will be difficult to melt). Leave the chocolate mixture covered with cling film to cool in the fridge overnight. The next day, take the mixture out of the fridge. With the help of a teaspoon, scoop out 18-20 pieces. Lay them on a tray with baking parchment. Let them chill for 30min in the freezer. Now they are ready to be rolled. 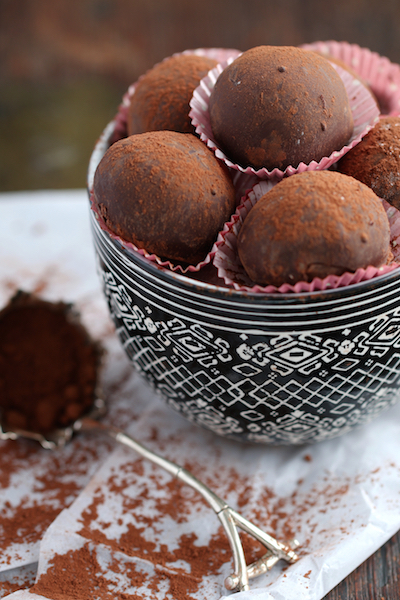 Roll each truffle with your palms into a ball. Place them back on the tray with the baking parchment and put in the freezer for another 30min. 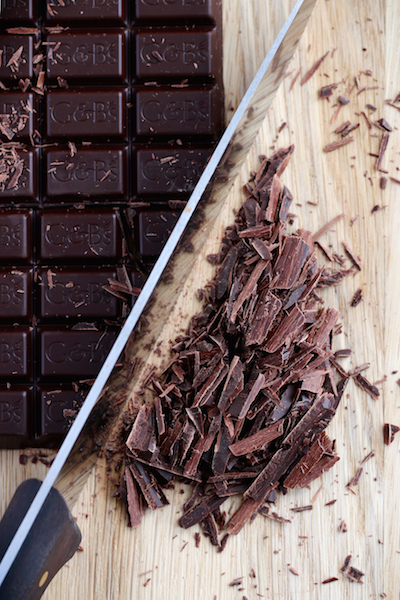 5min before the end, start melting the dark chocolate in a heatproof bowl over a pan of simmering water. When the chocolate has just melted, take the bowl aside (if the chocolate gets too hot it won’t stay glossy!). With the help of 2 forks, dip one truffle at a time into the melted chocolate, hold it with the fork over the bowl so that the excess chocolate can drain back into the bowl. Place the dipped truffle back on the baking parchment. 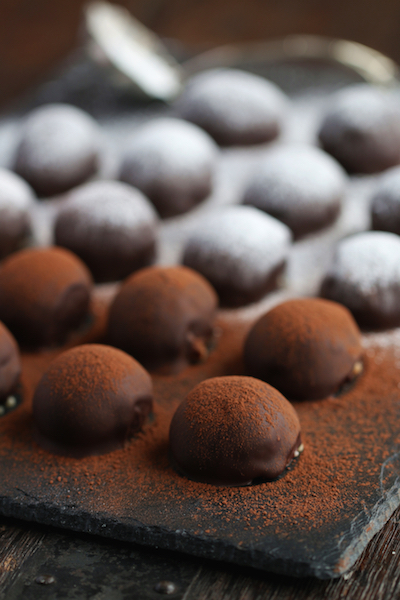 Put the truffles immediately into the fridge to cool down. When ready to eat, sprinkle with dark cocoa powder or icing sugar. You can keep them for a week in the fridge or prolong this period by freezing them. Make sure to use good quality chocolate as it will have a big influence on the taste. Try other variations by skipping step 1 and exchanging champagne and vanilla pod with: 3 tbsp Baileys (make the filling with milk chocolate and 100ml/3.4oz cream); 2-3 tbsp rum (make the coating with white chocolate and roll in shredded coconut after dipping); 2-3 tbsp kirsch (make the filling with dark chocolate and 200ml/6.8oz cream). 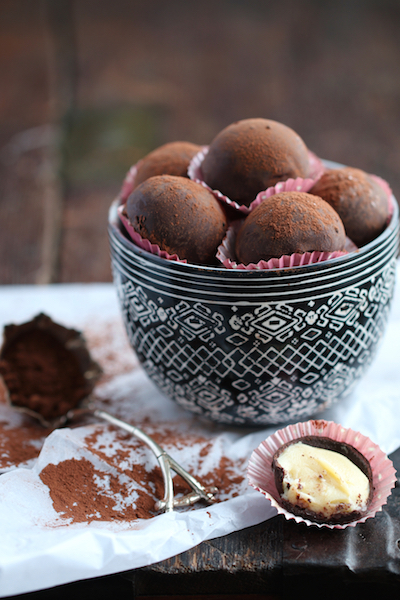 These ‘Champagne Truffles’ make a perfect gift for loved ones! This entry was posted in Food, Food Photography, Food Styling, Recipes and tagged dairy, dessert, indulgence, photography, treats, vegetarian by Françoise La Prune. Bookmark the permalink. I love your recipe for truffles. I often cook on valentines day as I think you can eat out any time of the year, appreciate each other that one time of the year! Yours look amazing, hope they were appreciated!